RIYADH, Saudi Arabia: PRNewswire: Paris Gallery, the leading luxury retailer in the region, opened its new opulent store in Al Hamra Mall. The opening ceremony was held under the patronage and presence of Mr. Yaqoub Al Sharif Al Hashemi, Sara Group Executive Director and other chief guests including senior officials and diplomats led by His Royal Highness Prince Mohammed bin Faisal bin Mohammed bin Abdulaziz Al Saud, French Ambassador François Gouyette, Doctor Rosela Rosi, the deputy Ambassador and the Italian Trade supplement in Al Riyadh, accompanied by the director of public relations at the Italian Embassy, and the Charge Affaires of the UAE Embassy Ahmad Al Tanayji and an elite of businessmen and society. Paris Gallery has been catering to the unique needs of customers in KSA with distinctive merchandise and superior customer service. 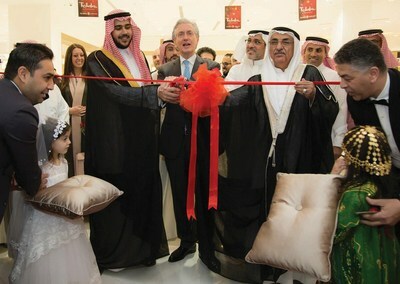 The launch of the new outlet reinforces the retailer’s strategic expansion plans in the region. Located in Al Hamra Mall in Riyadh, the store spreads over 1000 square meters of luxurious retail space and houses a vast array of international luxury brands in watches, perfumes, cosmetics, eyewear, accessories and leather goods. The retailer’s eye-catching retail concepts, impeccable service standards and traditional Arabic hospitality a practice sees it stand out as an unequivocal shopping and gifting destination in the Middle East. “We are glad to announce the opening of another store in KSA. With Paris Gallery’s solid reputation and expertise in luxury retail and customer service, we will deliver the unique, experience to the visitors of Al Hamra Mall. We look forward to accelerated growth through our on-going focus on luxury and service,” said Mr. Yaqoub Al Sharif Al Hashemi. Paris Gallery is known for its quality products, luxurious in-store ambiance, well-trained staff and its signature Arabic hospitality. In KSA, Paris Gallery has more than 14 luxury specialty stores located in prime retail areas across the kingdom, each outlet offering a premium assortment of over 650 international brands.